Location: North 62:15.528, East 6:18.663, this is GPS at the summit. How to get there: From the village of Ørsta, drive 4 km south-east on Hwy. 655. Just as the road crosses the river Storelva, make a left before the bridge. (There is a parallel road going up the valley on the other side of the river as well, this is also possible, but perhaps slightly longer wrt. driving time.) Approximately 7 km up the valley, the two roads meet (this is near the farm Kolås), and a dirt road with signs for Standalen continues. This road heads up Øyadalen and reaches the small lake Standalsvatnet (363m) after about 4 km. The very nice hut, Standalshytta, has a short access road to the left shortly after the lake. Standalshytta belongs to Ålesund ski club, one of the oldest ski clubs in Norway. One section of the hut is operated as a self service DNT hut. It is not often these huts can be reached by car, however, one should bring the food needed, since this hut did not appear to carry a food supply. The hut is locked with the DNT standard key. Route description: From the Standalshytta, head north just on the left side of an open (farmed) field. There is a trail here, but it may be difficult to follow as several wet meadows are crossed. 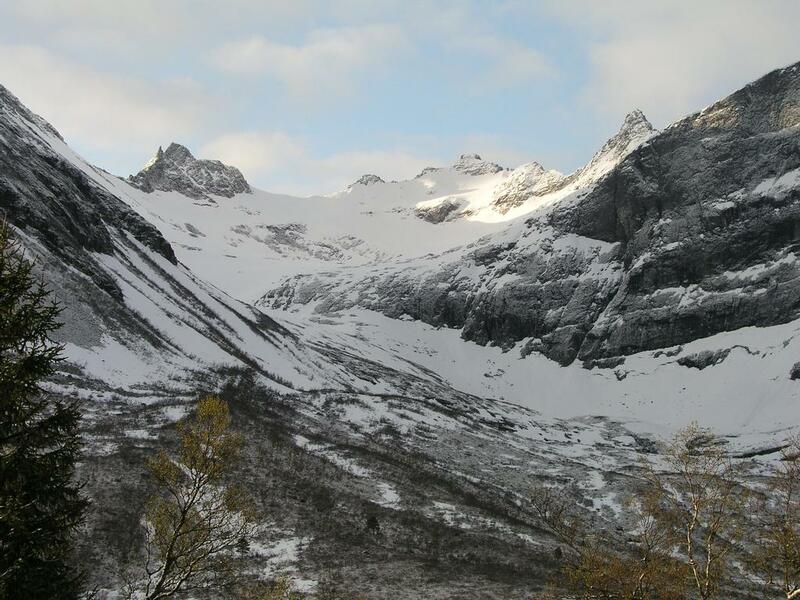 The narrow opening of Kvanndalen valley at the base of the rugged Sætretindane is the first goal. 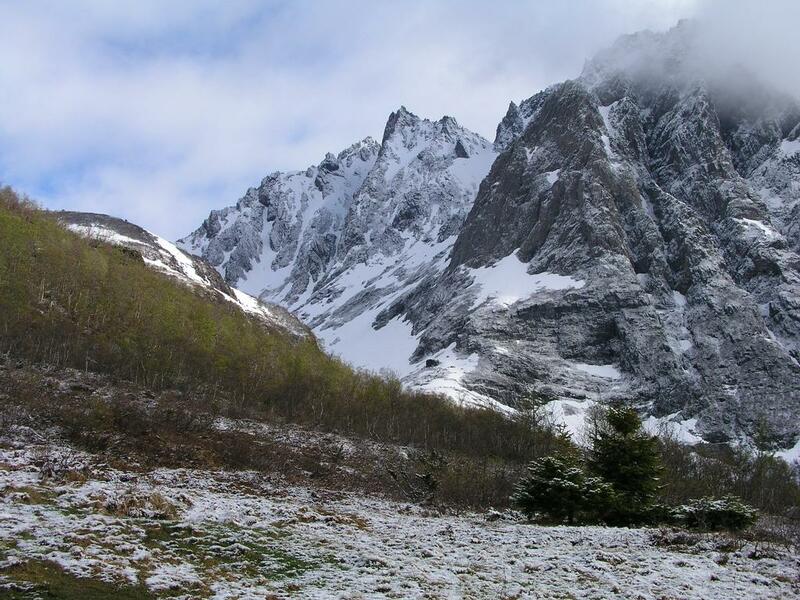 The best way there (at least in the spring time with the snow line higher) is likely to climb the hill on your left fairly early towards the upper part of the vegetation, then continue the climb at a fairly gentle angle in order to end at the distinct opening of the valley. In Kvanndalen (where we could start skiing) the terrain is more gentle, the valley is narrow in the beginning, but then becomes wider further in. There is avalanche danger from the Sætretindane (on your right). Continue straight ahead, first north-west, then north as the valley climbs higher. The glacier below Kolåstinden is higher up on your left. Straight ahead on the left is a steeper cliff, the route will circle this and access the glacier higher up via a narrow "cut" in the ridge that closes off the Kolåstinden glacier to the north. Higher up, the valley turns left (west), one can ascend directly to the small ridge-top called Appelsinhaugen (The place to have an orange), or ski a slightly larger arc and ascend a bit further north. 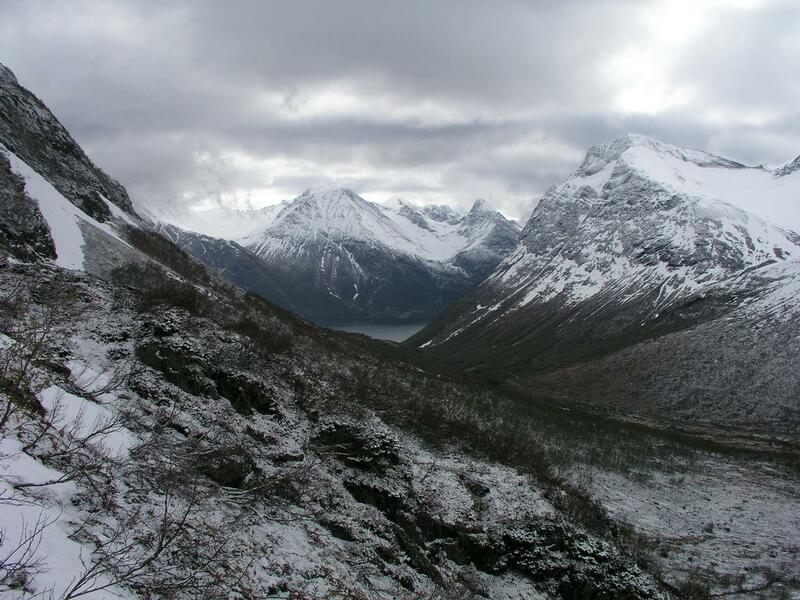 The next objective is to continue up this valley to the saddle called Kvanndalsskardet (1030m). From here, the cut in the ridge should be clearly visible. This cut, called "Stretet" (formerly also "Strait du Calais") is very narrow, but the deepest cut in the ridge. 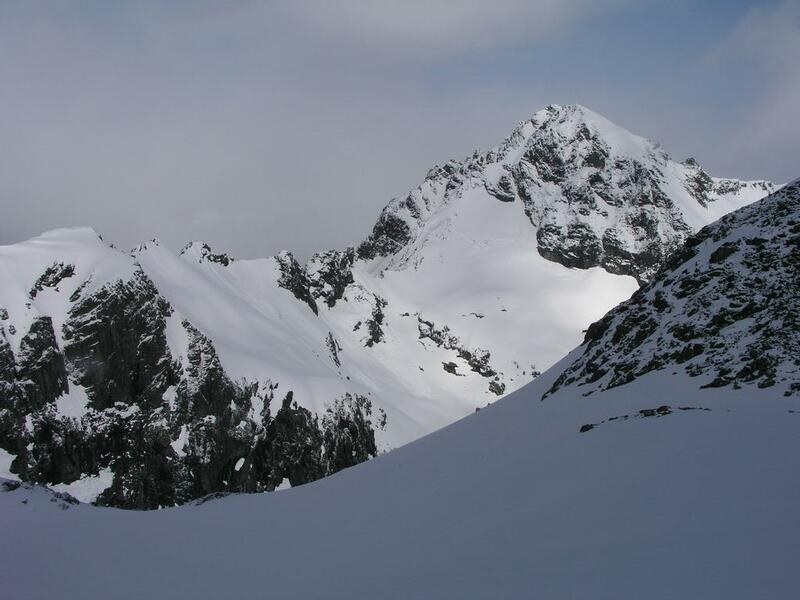 It is reached by skiing steeply on an ascending traverse from the saddle. There is a second "cut" in the ridge further west, this one is substantially higher, by one account called the "lobster col", do not head that way. 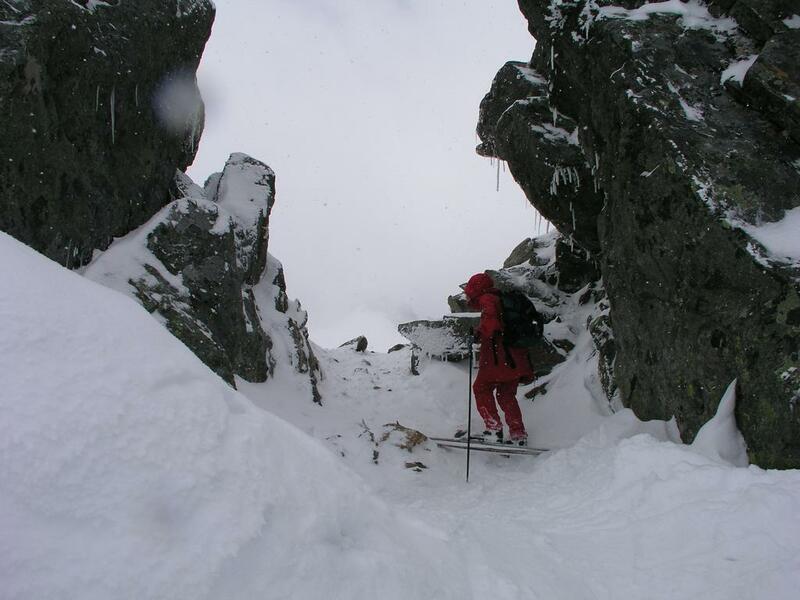 Under unfavorable conditions the climb to "Stretet" may be difficult, possibly more easily done on foot than on skis. 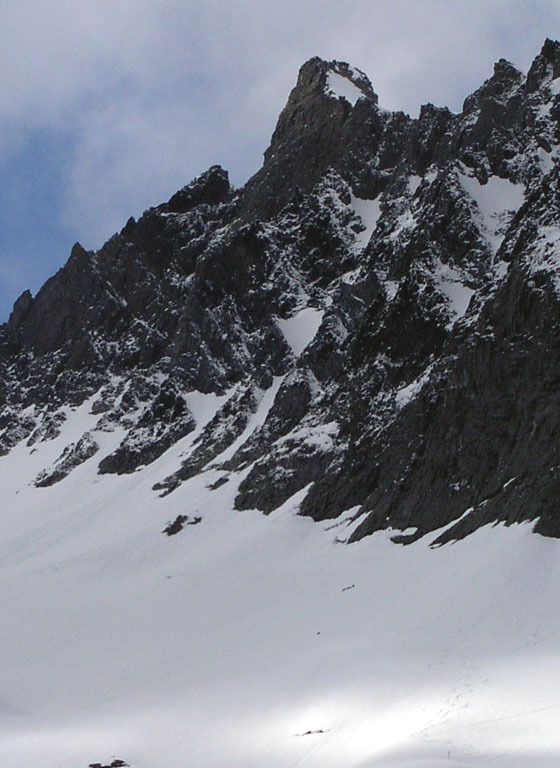 There is a single cliff below the route near its end, otherwise just a steep snow slope. The access to the glacier immediately on the other side of the "cut" is normally quite easy. This glacier has crevasses and, in particular, bergschrunds (crevasse between rocks and the ice), roped travel may be needed in late spring and in the summer. The route continues fairly steeply up the glacier, then more gently in a large ascending arc with the spectacular rock formations on your right. 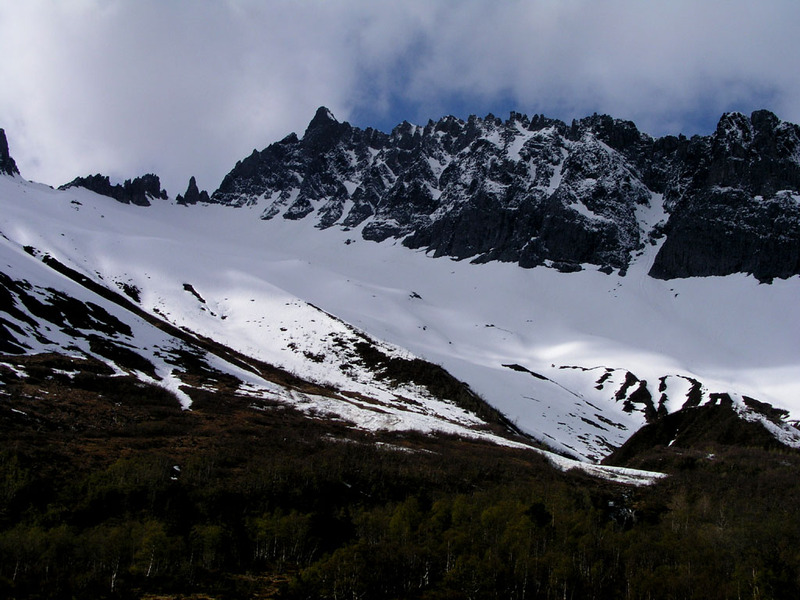 The peak is at the opposite side of the glacier when viewed from the point of glacier access. Near the peak itself, the terrain gets substantially steeper and most skiers continue on foot. Be aware that there normally is a substantial crevasse in this transition area between the glacier and the Kolåstinden itself. Continue left until the top snow field is visible straight above you. 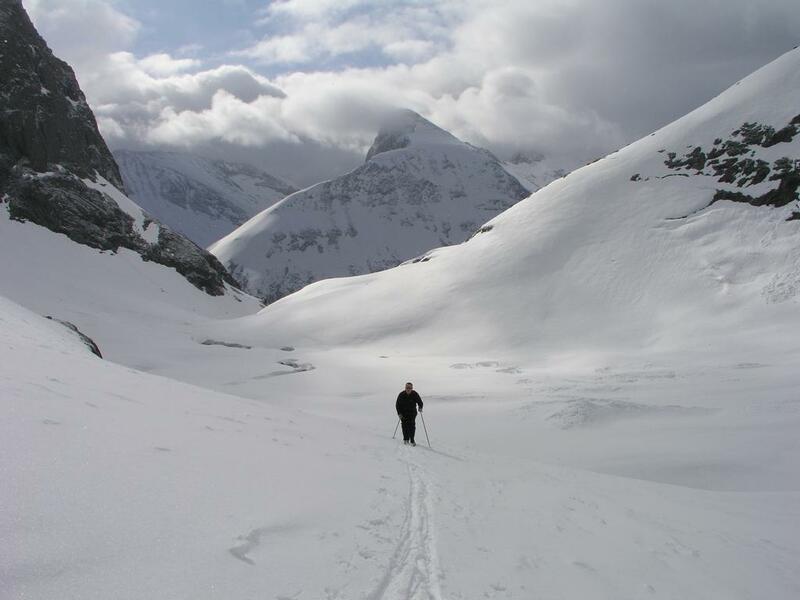 Depending on the conditions, an ice axe may often be useful for added security in this area. 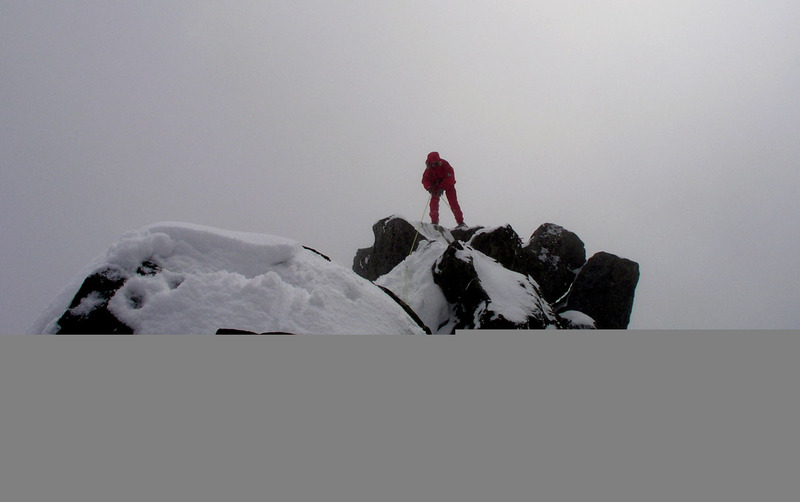 Immediately upon reaching the top ridge there is a metal container with a guest logbook. Most people turn around here after taking a look at the very steep slope going directly down to the Standalen area. However, this is not the highest point. Turn right and scramble up and around some large rocks. The short, but very exposed top ridge is now visible. 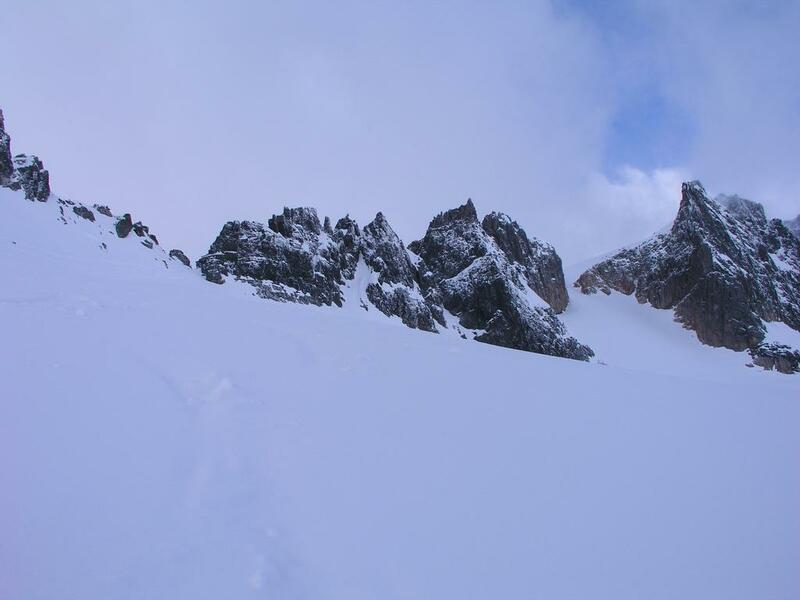 The traverse of this ridge is not difficult, but carries considerable exposure. With snow and ice, some parties will choose to use a rope for added security along this area. It appears that the two end points of the ridge have approximately the same height. 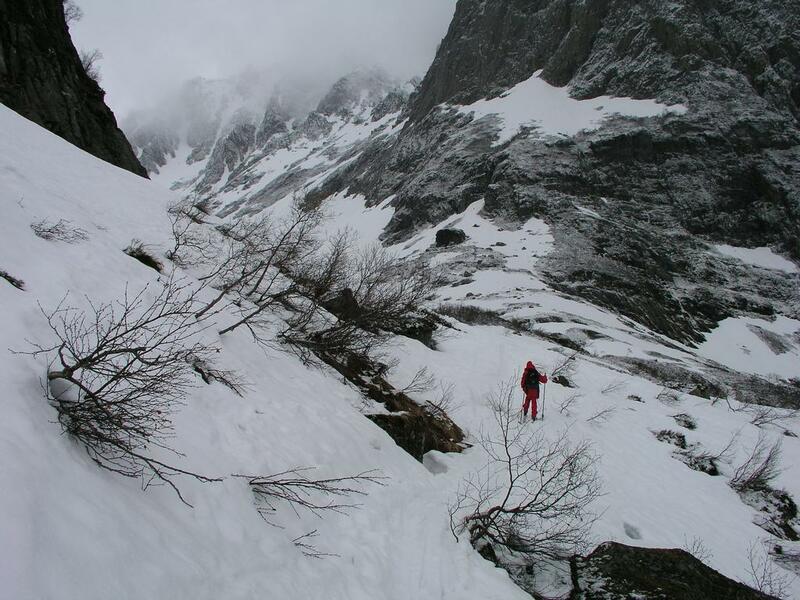 Comments: I did this climb with my son Pål Jørgen, age 14, and my friend Jan-Frode Myklebust. We had mixed weather, unfortunately not very good views from the summit, but enough to spot the valley floor in Standalen. The climb took about 4.5 hours, we spent about 30 minutes exploring the top ridge before returning to Standalshytta in about 2 hours. The top ridge runs south-east from (N 62:15.528, E 6:18.663) to north-west (N 62:15.539, E 6:18.657), a distance of about 20 meter. Morning view from Standalshytta, the view is south towards Grøtdalstindane. The entrance to Kvanndalen, Sætretindane (north/south) summits (1365m/1358m) to the right (behind/front). Pål Jørgen at the entrance to Kvanndalen. View back from Kvanndalen across Hjørundfjorden to Hjelledalstindane (1543m), Dalagubben (1344m) on this side (right). Jan-Frode in Kvanndalen Fremste Nøvdalshornet (1305m) behind. View from Kvanndalsskaret, Romedalstinden (1295m). Stretet, is the left side cut in ridge, it is much steeper up there than it looks. 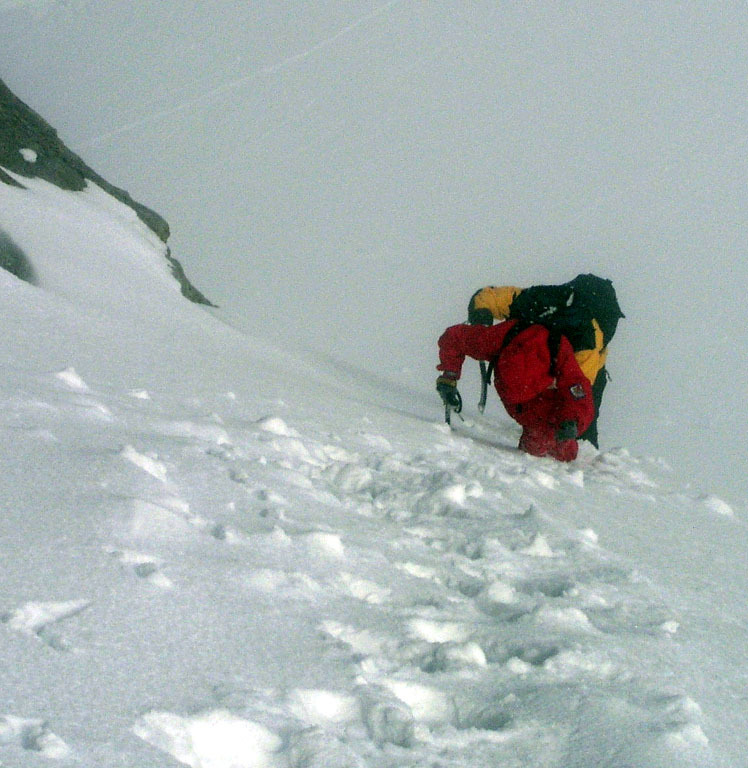 Pål Jørgen and Jan-Frode ascending steep snow. Pål Jørgen traversing the sharp top ridge. Kolåstinden, the summit as seen from the road in Standalen.